Saturday’s training yard focus was to combine two weak five-frame nuc hives into stronger hives. These two hives were from July summer nuc production. Both of the nuc hives had viable queens with some brood but both exhibited low total bee population and had limited food storage. While it was possible (although doubtful) that these two hives could have overwintered, demonstrating how to combine hives was a more desirable goal. Several people had expressed interest as they have both a weak hive and one or more stronger hives. We also discussed re-queening at this time of year, adding frames of brood from stronger hives, feeding options and other techniques for salvaging weaker hives. Both weaker hives (henceforth the “donor” hives) had a queen and some brood. The newspaper technique was implemented. Both receiving and donor hives had a two-frame internal feeder and were composed of two five-frame supers for a total of 8 frames. Because we want to go into winter with three five-frame supers, some extra manipulation was required. Both the receiving and donor hives were opened and the feeders were removed. Bees were shaken from the feeders back into their original hive. With the feeders removed, the receiving hive had two frame spaces open. To fill this space, two frames of brood from the donor hive (the bees were shaken off) were moved into the receiving hive. After this move, the receiving hive now had two full five-frame supers (10 frames total) and only its original bees plus two frames with some brood from the donor hive. A single sheet of news paper was placed over the receiving hive. An empty five frame super was placed over the newspaper. The remaining frames from the donor hive were searched for the queen. She was found and we caged her with some nurse bees as a 2nd training experience. The now queen-less donor hive’s frames were examined for brood and stores and five of the best frames were moved into the empty super (over the newspaper) making the receiving hive three supers – the desired overwinter configuration. The bees on the remaining frames, bottom board and inner cover were shaken into the super. The now empty equipment was placed back on the donor’s hive stand to recover as many of the returning field bees as possible. After some time, the returned field bees were shaken into the receiving hive’s top super and the now combined hive was closed. Donor hive bees are unable to exit the hive until the newspaper barrier is breached. This same process was followed on the other nuc we combined except the queen was removed as the hive’s brood pattern was small. Any advantage of re-queening in late September was not a good option. As a side note, all the traning hives have been treated for mites and the mite count testing is indicating low mite numbers although higher (3-5 per 300 bees) than desired. Late summer treatment is continuing. Mite counts have been a topic of discussion at each visit. Combining high-mite-count hives is felt to be of no practical value. In addition to the combining of two nucs, five frames of capped honey was added to a separate nuc, demonstrating how frames can be stored frozen and then later used as a supplement. This nuc is from a locally produced queen cell generously donated in late July by a team member. The hive is doing very well with lots of bees, brood and low mite counts. The rest of our work was to add syrup to the feeders and check brood levels in the other hives. All hives are being fed. We found brood in all hives with the expected capped stores in the upper super(s) and upper brood areas being back filled with nectar. There appeared to be reasonable pollen levels available, both stored and still flowing into the hives. There is a good quantity of yellow blooming vegetation in the immediate area of the beeyard. Discussion for the 2019 plan continued throughout this visit. The emphasis on nuc production in 2019 is the prevailing proposal. Generally speaking, the plan is to bulk purchase queens for April 2019 and setup an additional section in the yard for a “make your own” nuc where those that wish to participate could start a nuc from the overwintered hives. The person could then purchase the nuc in some combination of frames in a transportable box or possibly purchase the entire hive so that they would have equipment to make additional nucs at their yard. There are a lot of details (such as pricing) to work out so suggestions are welcome. One other proposal for 2019 is to continue the use of queen castles to produce additional resources and help control the urge to swarm. We had a beautify day to work the hives and demonstrate more advanced beekeeping skills. Thanks for your continued support. We have now completed the last phase of our re-queen and midsummer nuc project. All three queens appear to have been successfully accepted by their hive mates. All were active at the time of release today. All three are marked red. We also did a 2nd mite check of the one hive that had 11.8 mites per 100 bees. As you recall, this very high mite count triggered the midsummer use of formic acid treatment. Because formic acid is labeled for use at lower maximum day time temperatures than is normal for late July, this was a bit of a gamble. The cooler temperature and rain helped us out here and there is no apparent damage to the bees. The other good news is that the treatment appears to have worked as evidenced by the huge number of dead mites on the mite count board. We didn’t count them but there was a lot. We did however, perform an alcohol wash and found 1 mite from our sample. 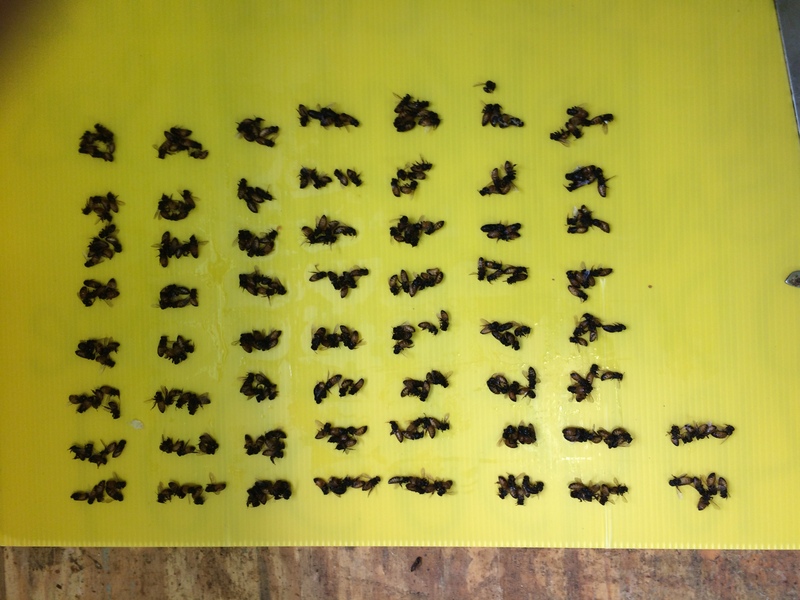 Our sampling technique is still in the training phase and this time there were 147 bees in the sample. Even if the sampling was not the desired 200 – 300 bee, this is a substantial improvement in mite load per 100 bees. As a precaution, we added an Api Life Var wafer because there was larva being pulled from several cells. This larva did not look normal which could be from formic acid treatment as it penetrates the cell caps but more likely from the major mite infestation. Remember that was some evidence of K wing disease in this hive so the brood might not be the best quality. This hive is not out of danger yet. What a learning experience. Other than releasing queens and testing for mites in the one hive, we discussed a variety of other bee related subjects. The hives are now well on their way to the fall/winter management process which will consist of feeding to build up the summer nucs and to keep brood production up for healthy winter bees. We are 4 ½ months from the first day of winter. The focus will now shift to winter stores management and the production of “winter” bees. Our nucs will take some extra attention. The next visit will be on Saturday August 11th at 10:00 AM. During this next visit, the egg/larva productivity of our three new queens will be evaluated. As it will have been 14 days from release of the queens, there should be some capped brood in a reasonable pattern with larva in the outside arch of the brood nest. Remember the worker bee brood cycle – egg to capped brood is nine days. Worker bee emerges on day 21. Queens can lay well over 1,000 eggs per day. Today’s rain free Clermont hive check was successful. The main activity was to treat all but one hive and the queen castle with Api Life Var. The untreated hive is targeted to produce a reasonable amount of honey that we plan to extract in several weeks so treatment is delayed for that hive. The amount is still undetermined but probably will be 14 to 16 frames. After two years of hard beekeeping work, a bit of sweet reward will be nice. We shall see! The queen castle Q1A/B combined section (6 frames) has varied issues. The 6-frame section is now reduced back to 3 frames housed in section Q1B (section Q1A is empty). The queen was observed but no evidence of her being productive was visible. She is from the 2018 BONS queen purchase. The other 3-frame section is also not showing visible productivity from the newly introduced queen (which we saw) from the BONS queen class. We opted to allow one additional week before making any queen decisions for either section. The major observation was that possible mite load issues and associated brood problems were beginning to be visible. Several hives showed brood cells that were open but the larva was in an advanced stage – some beginning to be in the purple eye stage where normally at this stage, brood would still be capped. We even observed one well developed larva being removed by attendant bees. Although any mite issues are currently small and the hives still have good bee cover and reasonable brood pattern, seeing and discussing the beginning of mite concerns was felt to be helpful. We were also able to pull out several larva and see attached mites – thanks to those forward thinking beekeepers with magnifying glasses. By label instruction, Api Life Val is three treatments at 7-day increments so the next visit will be on Sunday July 1st at 10:00 AM. The sole purpose of this visit will be to install the 2nd treatment although we may sneak a peek into the queen castle. The third and final treatment will be installed on Sunday July 8th if I’ve counted the days correctly. As it is now late June, and the mite treatment will run for at least 21 days until mid-July, any queen replacement and summer nuc production will be after all that treatment settles in a bit. I’ll probably order queens for delivery Thursday July 19th or Thursday 25th. We can discuss the merits of these dates and start planning on what we can do for strong fall hives and production of overwinter nucs. Planning for Spring 2018 has started! All things considered, our Clermont yard continues to do reasonably well. The yard has many of the issues every beekeeper has to respond to and resolve. 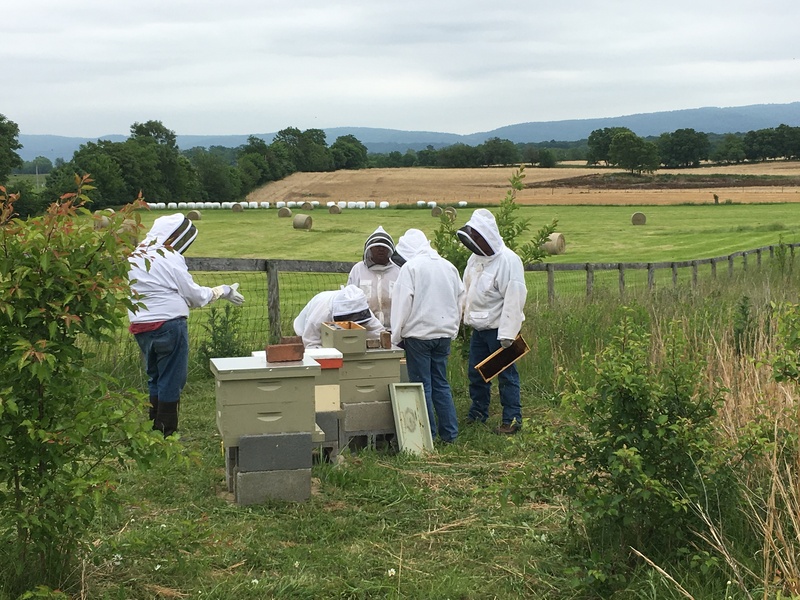 As discussed, we will focus on what we can decide and control – queen productivity, mite infestation and mite caused issues, plentiful food and protein, hive location, frame and comb quality, and most importantly, continuing to enjoy and learn from our yard visits. Yesterdays Clermont visit yielded interesting beekeeping discussion covering a large variety of subjects. The weather was again cooperative with reasonable temperature and no rain. Hive 21- This hive is doing well and had heavy bee population. The frames were well covered with brood and bees so a 3rd super was added. The top super was switched to the bottom and the new super was placed on top. This new super has both comb and foundation. There was a bit of concern with possible queen issues as some of the brood was a bit spotty. Hive 22 – Good entrance activity. Nectar and capped honey in the top super (4 supers) with brood and larva in the 3rd super. Hive appears to be happy. Hive 23 – Not as much bee activity as we would like. This hive was treated with MAQS May 12th after alcohol wash test showed some level of mite infestation. The brood is in both capped and larva stages but is still a bit spotty. There is little evidence of deformed larva but hive may still have mite issues. Re- queen is a possible solution. Hive 24 – Drawn comb and capped honey in top super (4 supers) and 3rd super with no brood in either. Capped brood and larval in 2nd super possibly back filling 2nd super with pollen and nectar. Hive is doing well. Hive 25 – This one has been a weak hive all 2108. It is now condensed down to one super due to low bee cover and a wax moth issue. There is brood in larva and capped stages. Possible solution is to combine with other weak hive. Q1 ABC – This queen castle hive was 9 frames as the dividers had been removed at last visit. We add one divider back separating three frames of foundation and no bees from the other 6 frames with bees and brood. We found the queen so as a minimum she is not performing well. Possibility is to re-queen with a queen cell using the empty section and brood from a strong hive. If that is successful, the old queen will be removed and the sections combined. N11 – This nuc was produced from queen castle Q1 B. lots of larval in outside frames of 2nd 5 frame super. Comb is being drawn in top super (3 supers). Empty brood cells are being back filled as brood space is still limited to the 1st and 2nd super until the comb is drawn. Good bee cover. N25 – From Q1C on 5/26. Capped brood and larval in a tight dense pattern. As this nuc was started from three frames about 2 weeks ago, it is doing well. Foundation is being drawn into comb. Yesterday’s Clermont visit covered a wide variety of subjects, presented lots of issues for discussion and was hopefully informative for all. The day was warm, not too hot and there were a lot of bees flying. The bee yard has a medium cover of flowering plants and the lower center area had standing water from the heavy rains. Perfect! Hive 21- BONS 2018 package: Lots of bees with pollen, capped and uncapped larva, nectar, emerging bees and normal drone comb. The feeder was filled to ½ full. Hive is two 8 frame supers with two space feeder. Hive 22- overwintered nuc: Drawn comb in the top eight frame super with capped honey. We saw the queen and there is a good brood pattern. This hive is not being feed as the honey might be extracted. Hive 23 – overwintered: We removed the depleted formic acid strips. There was a lot of larva in various stages of development. This hive appears to be rebounding well after the 7 day mite treatment and is hopefully now much less than the 1.4 mites per 100 bees as determined by testing with alcohol wash during the last visit. Larva from drone cells was checked and appear to be pure white and normal looking. We fed this hive. Hive 24 – overwintered: Ant issue was treated with ground cinnamon. We checked this hive twice. On the first check we were thinking that the queen had failed and decided to possibly add a queen and bees from the queen castle. There was capped brood but no evidence of larva. On the second examination mostly to find the existing queen (if there was one) we checked each super (there are five) and found capped brood in bottom, second and third super. In the process of this careful examination we found what appear to be multiple open queen cells with jagged edges possibly indicating a new queen(s). We found a queen but did not see eggs. As there was a swarm at the yard two weeks ago, one possibility is that this hive swarmed and the replacement queen has not gotten fully productive. With all this information, we decided to practice watchful waiting and did not add anything. May check this one hive off schedule next Saturday. Hive 25 – overwintered with boost from two frames of brood and the queen from queen castle Q1C: This hive is two eight frame supers and is showing signs of recovery from the early spring queen failure. Changed out feeder and added syrup. Bee cover was medium and we saw queen and larva. This is still the weakest hive at Clermont and continues to be a challenge. Q1A – This six frame queen castle section (A and B) is doing well. Divider was removed and three frames of foundation were added. See Q1C below. It is now nine frames with the one extra frame space equally split to the sides. These bees will probably be moved into a three super nuc at the next visit hive and overwintered. Q1B – Moved to nuc 11 then space combined with section Q1A on May 12th. See Nuc 11. Q1C – This section was in need of more space so it was moved into a two super, five frame, nuc (N25) for a total of eight frames and a two space feeder. The back-filled frames are foundation so there should be plenty of space now. All three frames had brood in different stages. Target is to overwinter this nuc. Nuc 11 – from Q1B: Excellent brood pattern, capped and uncapped larva with pollen and capped honey. We added five frames of foundation moving the feeder up into the newly added third super and back filling the second super with foundation on the outside. It is now three supers and 13 frames. Target is to overwinter this nuc. Nuc 25 – Newly created from Q1C (three frames) now with eight frames and a two section feeder. Brood is solid with capped and uncapped larva, a good amount of pollen and capped honey. Target is to overwinter this nuc. Clermont is now at nine hives in various stages of health. The process to get them winter ready is beginning. June 21th is the longest day of 2018 and is approximately 2 ½ weeks away. Mite control, queen quality and ample winter stores will become the training focus for the remainder of the season. Yesterday’s Clermont inspection was informative and yielded several items of interest. The weather was perfect for opening hives and as always, Clermont’s mountain backdrop was spectacular. One of the most noteworthy activities was the swarm that landed in the grass just down from our hives. It kept landing in and flying from the same spot in the grass. There is something magical about being in a swarm of thousands of flying bees! At one point the swarm attempted to cluster in a tree but changed and disappeared only to return. At the end of our inspection the swarm was once again gone. Hive 21: New from a 2018 BONS package. We observed both capped and uncapped brood with a solid pattern and good bee cover. Pollen and nectar storage was acceptable. Hive is progressing well. Currently two supers of comb and a 2-frame feeder. Hive 22: From an overwintered swarm nuc. Good bee cover with capped brood and larva in the second super. This hive was re-queened May 1st. We removed the empty queen cage and will wait to see if brood activity picks up. It has only been 10 – 11 days for the new queen, several of which she was caged. Hive 23: Brood pattern was not as good as expected. Shows “shotgun” pattern with cells that did not appear to be healthy (somewhat dark and not normal looking). The spotty pattern maybe caused by mite problems so an alcohol wash mite test was performed. There were multiple queen cells observed. This hive will be closely monitored. Hive was treated with Mite Away Quick strips. More about the mite testing process at the end of this document. Hive 24: Ant issue has been resolved using cinnamon and there is now no evidence of any ant activity. This hive has a 4th super that is almost fully filled with capped honey. An additional super of foundation was added. Multiple queen cells and drone brood was noted. Possible queen supersedure or swarming activity is underway. Hive 25: Our problem hive. Very few bees with poor almost nonexistent brood. After the morning session, I returned and moved two frames with the queen from Q1C into this hive. I compacted the hive down to two supers and a 2-frame feeder. These two frames are well covered with bees and capped larva so this should work. Experimenting with beekeeping technique is what we are doing. Q1A: Solid brood and bee cover. Expanded this section into Q1B so now Q1A and Q1B are one section with 6 frames – three are foundation. If this works as planned, the next step is into a 5-frame nuc for overwintering. Q1B: This very crowded section of three frames was moved into a 5-frame, 2-super nuc (now nuc 11) with a 2-frame feeder for a total of 8 frames. Q1A was expanded into the empty space. Q1C: Moved two of the three frames including the queen into hive 25. The space was back filled with empty comb. A queen from the local supplier was added. She is marked red. Nuc 11: Newly setup from Q1B. The queen was observed and the three frames of brood were moved into a 5-frame, 2-super nuc with a 2-frame feeder for a total of 8 frames. Two frames of brood were placed into the bottom super and one frame of brood was placed in the center of the top super. Mite sampling was performed on bees from Hive 23. After the testing, 3-5 mites were counted. This technique utilized a device manufactured by Veto-pharma trade name Varroa EasyCheck. The testing followed the recommended process where 300 bees are collected, washed with alcohol and the dislodged mites counted. I counted the bees to determine how close to the desired 300 bees we were and got 290 bees. I separated the bees into groups of 5 bees and got 58 groups or 290 bees. See the attached photo. The results (~4 mites on 290 bees) yield a 1.4 mite per 100 bee results. While is number is towards the lower allowable mite count we decided to treat base on additional observed issues with this hive. The first 2018 Clermont visit was well attended with a mix of new beekeepers and previous year beekeepers. The day was perfect with clear skies highlighting the natural beauty of Clermont Farm. As of yesterday, there are five 8 frame hives, one 3 section queen castle and a swarm catch box at the Clermont site. Each hive demonstrated a level of activity that would be expected from the start up of a package hive to hives that were over wintered. The 2nd year of the Clermont training yard will be an instructive mix of first year beekeeping techniques and more advanced beekeeping activities. As was the practice last year, we will be focusing on queen productivity, hive management and disease control. Hive 21 – Source is a 2018 BONS package. The queen was manually released as she appeared to be well accepted and the desire is to get her productive ASAP. Because the package was installed on drawn comb there should be larva and capped brood by May 12th. Hive 22 – Source is over winter nuc from swarm. Bee cover and activity was good but brood was not solid and there appears to be an issue with the queen. There is the beginning of queen cells. This hive will require close observation and likely a replacement queen. Hive 23 – Source is over wintered hive. This hive has donated frames of brood to the queen castle twice and continues to be productive with solid bee cover and brood. There is evidence that it is preparing to swarm. There are queen cups on the bottom edge of frames. Hive 24 – Source is over wintered hive. This hive has also donated frames of brood to the queen castle and continues to be productive with solid bee cover and brood. This hive also appears to be preparing to swarm. A super of foundation was added for a total of 4 supers. Hive 25 – Source is over winter hive. This is our problem hive. It was re-queened April 25th with a BONS queen. The existing queen had been captured into a queen cage to stop her from laying mostly drone. The new queen was inserted with the cork left in place. She will be manually released on Tuesday. Q1 A – Source is brood frames from hive 24 and a BONS queen. Setup April 25th. The queen was manually released. Q1 B – Source is brood frames from hive 23 and a Saskatraz queen from Eversweet Apiaries. Installation was on April 4th. The brood pattern is solid and this 3 frame nuc will need to be moved into more space likely during the May 12th visit. This will open a section for possible queen cell movement. Q1 C – – Source is brood frames from hive 23 and a BONS queen. Setup April 25th. The queen was manually released. A swarm catch box was installed in the same Clermont tree that successfully attracted a swarm last year. Free bees are the best bees. We covered a lot of beekeeping activities. As is the normal practice at Clermont, everyone had the opportunity to open and inspect a hive. There was lots of good discussion and questions about bees, packages and nucs. Thanks for your help with the Clermont hives. The decision to add a 3rd super to both the Clermont five frame swarm nuc and the Berryville eight frame swarm hive should put us in good shape for over wintering storage space for all the hives. All the bees need to do is fill it! The use of drawn comb, some with honey and nectar should be a plus. As discussed, the top super full and the middle super somewhat full would be the ultimate fall situation. Somewhere around 35 to 40 pounds of capped honey would be my goal. We will continue to feed syrup until cooler weather. There was no indication of mite issues. The 24 hour mite drop board and drone brood check finding no mites was a bit of a surprise to me! We will continue to check for mites, small hive beetle and brood production as part of our normal visits. Brood status in three of the hives was very good with frames of capped brood and lava. Eggs, which are normally hard to see, eluded us this visit. The fourth hive (from a package) appears to have a failing queen. This was determined from the spotty (or shotgun in bee speak) brood pattern. The brood was noticeably lower in quantity and has scattered drone cells mixed into the worker brood. One way a queen can fail is to run out of sperm from her one time mating flight. Unfertilized eggs produce male (drone) bees. This hive is currently sill strong with good bee coverage but will fail if not re-queened quickly. It takes 18 or more days for the bees to produce a queen from an egg, plus the time for her to mate and start laying, plus the 21 days for the first worker bee to emerge from the new queen’s first laid eggs. This process, while an option would create a weak hive that likely would not survive. The better method is to introduce a new fertilized queen either purchased or from a “banked” queen, typically from a nuc. We will be getting into nuc production and other bee yard management methods next year. This year and for my first time, I setup a “queen castle”, purchased from Brushy Mountain bee supply. It is basically a 10 frame medium super divided into 3 sections that each hold 3 frames. Each section has its own entrance and the bees cannot move between the sections. I have used it to hold (or bank) extra queens, most recently two weeks ago when I purchased queens to replace some of mine that were failing. I checked this morning and found that I have a spare queen happily laying eggs with a reasonable brood pattern. If my plan works, I will collect this queen and bring her to Clermont this coming Saturday, July 15 at 10:00 AM. It should be an interesting exercise in beekeeping because we will need to find the failing queen and remove her from the hive before introducing the new caged queen. We will let the bees get accustom to her then manually release her after a few days. I hope your bees continue to do well. Feel free to send your questions. There was a good bit of pictures taken at our last meeting which is an excellent way to record what you are seeing in your hives. We can pass around photos to get other’s opinions. Many thanks to the Clermont team for Saturday’s successful hive inspection. It was a beautiful day to check bees! We found all four hives to be in good condition. Feeders were changed out in all four hives and clean ones installed. Before closing each hive, the feeders were filled with approximately one quart of syrup. The two hives started from packages are now 3 supers with comb, nectar, pollen, capped honey and brood in good supply. We decided that the hive strength was medium strong with good bee cover and properly drawn comb. As expected, there is still some foundation on the outside frames and possibly in the lowest super. We only inspected until it was determined that the queen was laying after finding eggs. The Berryville swarm is still 2 supers with comb, nectar, pollen, capped honey and brood in good supply. This hive was also determined to be medium strength and has some frames of foundation. Capped brood patterns are solid so emerging bees should help with comb building and boost the house bee numbers. The queen’s productivity was determined to be acceptable. There were some empty cells in the brood nest but not enough to be cause for concern. This will be watched for the first sign of queen issues. The Clermont swarm is in a 5 frame nuc box. It too is doing well with, pollen, capped honey and brood in good supply. We found a small hive beetle and used a Scotch-Brite cloth to (hopefully) trap them. We will probably add a beetle trap on the next visit. The likely plan for this hive is to overwinter it in the 5 frame hive as it likely won’t be able to produce enough to move to 8 or 10 frame equipment. The two hives started from packages continue to do well. Both have 4 – 5 frames well covered with brood and a matching number of frames that have some amount of drawn or partially drawn comb. The comb with no brood is filling with nectar and capped honey. There is a bit of pollen stored next to the brood with the standard arch of brood (larva and capped), pollen, and honey in the brood frames. Observing the landing board revealed bees bringing in pollen (mostly red and yellow) even through it was raining a bit. We made the decision to add a 3rd super of foundation above the brood leaving the existing supers in the same order. The feeder was moved to the newly installed super and the space it occupied was back-filled with two frames of foundation. The two back-fill frames were put to the outside of the 2nd super which centered the brood nest. The current arrangement is three supers tall (22 frames) with the feeder in the top super. The feeder was filled with syrup. The Berryville swarm has filled the 8 frames in the nuc box it occupied and started to add burr comb in any available space including the feeder tubes. We saw the queen and confirmed the brood nest looked strong, with 3 – 4 frames of brood. This nuc is mostly on drawn comb so space for comb production was limited. We made the decision to move it into 8-frame equipment two supers tall. The frames were kept in the same order. The feeder was put in the top box and a frame of foundation was inserted between it and the brood frames. The feeder was filled with syrup. The Clermont swarm is not strong and we did not look too deeply as it has only been a week since it was moved into the 5-frame nuc box. The feeder was filled. There will be several options available depending on what the next full inspection shows. I plan to check the hives next on Saturday June 10th at 10:00 AM. Hope to see you there. Yesterday, a medium-sized swarm was moved from a swarm catch box into a five-frame “nuc” hive. This is the fourth hive for the Clermont bee yard. I’m not sure where these two swarms are from, but Berryville has been prolific in producing them! First on April 22nd the day the packages were installed, a swarm flew over and disappeared. On April 30th, I got a call to catch a swarm in Berryville, which I did. I put that swarm in a nuc box and moved it to the Clermont bee yard. Two weeks later, after our May 13th hive inspection, I noticed a swarm had moved into the Clermont swarm catch box that I installed in a nearby tree. Yesterday, that swarm was moved into a nuc hive at the Clermont bee yard. Two eight-frame hives supplied by BONS with package bees. Both of these hives have a total of 14 frames plus a two-frame internal Boardman style feeder. One five-frame nuc hive with a two-frame space feeder for a total of 8 frames. This is the April 30th Berryville swarm. It is heavy with brood. One five-frame nuc hive with a two-frame space feeder for a total of 8 frames. This is from the swarm catch box and was installed yesterday, May 20th. The swarm catch box was refilled with a frame of comb and 5 frames of blank foundation for a total of 6 frames. The swarm catch box was then returned to the lucky bee tree – we will see what happens! All these hives have multiple frames of capped brood and larvae in various stages of development. The package hives have the most frames of brood as they have a two week lead on the April 30th swarm and a four week lead on yesterday’s swarm. Because the two swarm hives have drawn comb there is a good possibility that they will quickly catch up to the packages. The package bees, started on blank foundation, have to draw comb before the queen can lay. I plan to check the hives this Saturday May 27th at 10:00 AM. During this visit, we will determine if the package hives should be reversed and frames rearranged to put empty foundation above the brood nest. It is also possible that the April 30th swarm will be ready to move into a standard 8-frame hive from the current 5-frame equipment. This swarm is doing well and has brood in at least 3 frames including the outside frame of the top super. The newest swarm will also be checked. All the hives continue to be fed syrup in my standard 25 pounds of sugar mixed in a 5-gallon bucket ratio with a healthy shot of my home-made essential oils supplement. Yesterday’s somewhat cold and overcast Clermont hive check was successful. Both package hives have at lease two frames full of capped brood with a good pattern. I say at lease because we only pulled two frames due to weather but I would guess there were additional frames with uncapped brood as the comb production is progressing normally. Bee activity was mostly in the top super and there was only a few bees flying. The sun broke out a bit and bee activity picked up around noon just before we left Clermont . I expect there to be a burst of new bees emerging from the frames of capped brood this week. Weather is forecast to be favorable for flight and with the new bees joining the existing package bee both comb and nectar production should increase. The feeders were filled about 1/2 full. The bees are using a lot of syrup most likely because the cooler temperature and rain has slowed down flying. I added a 5 frame x 2 medium super nuc to the mix. It contains a swarm that I caught last Sunday in Berryville. We didn’t see any eggs or larva but did see the queen. Basically the hives are progressing as I would expect. If you haven’t checked you hives in the last week or so, it might be good to have a look today or tomorrow and as a minimum, be sure there is syrup in the feeder. As all the BONS package hives were started about the same time, you should be seeing something similar in your hives. If we stick with the current hive check schedule, I’ll see you May 27th, 10:00 AM at Clermont. There is a good possibility that the next visit will include super rotation (bottom to top) and a bit of frame movement to keep the feeder in the top box. The end goal for this year’s beekeeping plan is to have 3 supers minimum on each hive with somewhere around 50 -60 pounds of capped honey in each hive for winter. Everything we do will be to meet this goal. 22April2017 Today I picked up and installed the two packages at the Clermont training site. Weather was not the best but I felt the bees would be better off in hives as opposed to the screen box while awaiting better weather. At least they can take cleansing flights if tomorrow’s weather is better. The the first hive install went well. I added about a quart of sugar syrup to a two frame internal feeder. Both hives are currently two 8 frame supers minus the two frames taken up by the feeder for a total of 14 frames. The queen cage for the 2nd hive had only dead bees in it. Not good, but the club had a few extra queens just for this problem. I went back to the package distribution site and got a new queen cage with all live bees. I installed this queen into the 2nd hive. Tomorrow morning is forecast to be a bit better weather with some sun and 60 temperature. I will probably drop in just to be sure thing are normal but won’t open the hives until later this week most likely not until Saturday. That visit will be to see if the queen is out and get an idea of how the install is progressing. Because most of your bees are on empty foundation the production of eggs will not start until there is some drawn comb for the queen to lay in. As I have clean drawn comb available, I took the liberty of adding a frame of it to each hive. So I plan to open both hives next Saturday 4/29 around 10 AM weather permitting. The purpose of this visit is to remove the queen cage and do a general check of the progress of the package. I would expect to see the beginning of comb production and with some luck, eggs in the drawn comb. Please let me know how things are going for you and feel free to email any questions you may have.